On October 19, 2018, an exhibition of universities of the city of Beijing (People's Republic of China) was held in the Russian New University (RosNOU). The exhibition was organized by the Education Committee and the Department of International Educational Exchange of Beijing, the Association of Chinese Language Teachers and Sinologists (ACLTS) and the Russian New University. The exhibition, devoted to the system of grants and scholarships for students from Russia, was visited by students of MSU, MSPU, MIPT, RosNOU, RUDN and other Moscow universities, as well as by students of Moscow and Moscow region schools who study Chinese or English languages. Exhibition visitors were able to learn about educational programs of undergraduate, graduate and postgraduate studies in Beijing, to get an idea of ​​the system of state and university grants and scholarships. The event was opened by the rector of the Russian New University, Vladimir Zernov, who thanked the representatives of the Chinese delegation for coming and expressed confidence that our countries need to learn from each other. Sun Xiaowei, President of the Association of Chinese Language Teachers and Sinologists (ACLTS). The deputy noted that heavy industry is no longer the main factor of modernization – now it is human potential development, the key to which is education. 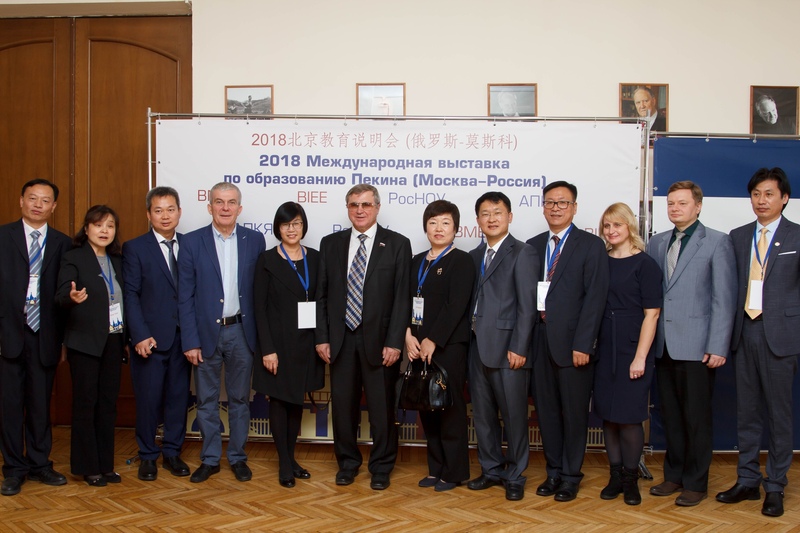 “It seems to me remarkable that Beijing education, as the leader of Chinese education, organizes this exhibition with the Russian New University, one of the leaders of the Russian non-state education,” added Oleg Nikolayevich. – “This is a very accurate initiative and another confirmation that non-state educational institutions solve state issues. “Today, about 30 000 Chinese citizens are studying in Russia, and about 130 000 Russian citizens – in China,” said Jin Honglian. – “We strive to develop mutually beneficial cooperation, expand academic exchange between Chinese and Russian teachers and students, which leads to the strengthening of mutual understanding between our nations." The exhibition was attended by nine educational institutions of China: the Central State University of Finance and Economics, University of Politics and Law of China, University of Media and Communications of China, Beijing Institute of Youth Policy, Beijing University of Information Sciences and Technologies, Beijing Agricultural University, Beijing International School of Art, School at the Beijing Polytechnic University and the Yongding School at the Metropolitan Pedagogical University. You can apply for a grant to study in China by contacting the Department for International Educational Exchange of a selected Chinese university, or to the Association of Chinese Language Teachers and Sinologists (ACLTS, atcls@yandex.ru).